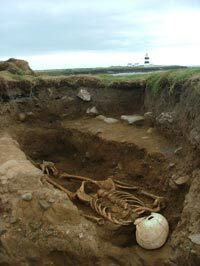 In 2005 Kilkenny Archaeology carried out an archaeological excavation for the Department of the Environment, Heritage and Local Government of an isolated human skeleton which had been eroding into the sea near the lighthouse at Hook Head, Wexford. The burial was that of a 5 foot 9 inch male aged between 21-25. The muscle markings in the upper body demonstrated the individual was no stranger to hard work. An unusual and remarkable survival from the body was the patch of very distinctive white sand that was present on his feet (bottom left). This was most likely in the victim’s shoes at the time of burial, the shoes having long since rotted away. Radiocarbon dating of the skeleton indicated he died sometime between 1790-1890 AD. He was one of about a dozen shipwreck victims that are known to have been buried on the Hook.